Doesn’t this vegetable look familiar? You can find it at just about every corner grocery store and you probably know it by another name: baby bok choy. In fact, its proper name is Shanghai bok choy or green stem bok choy. True bok choy has snow-white stems and dark green leaves with ruffled edges. Bok choy sum (“sum” means “heart” in Cantonese signifying a younger plant) is almost identical in appearance except for its smaller size, lighter green leaves, and most distinctly, yellow flowers. Miniature bok choy sum is also available and, confusingly, is sometimes called baby bok choy too. Shanghai bok choy has flatter stems than regular bok choy and its spoonlike leaves and stems are the same shade of light green. While it grows to about a foot or more, it is usually harvested young (6 inches or less) and sold in the “baby” stage, hence the popular label baby bok choy. How to buy and store: Buy tightly closed buds without yellowing leaves and store in the crisper for up to 5 days. 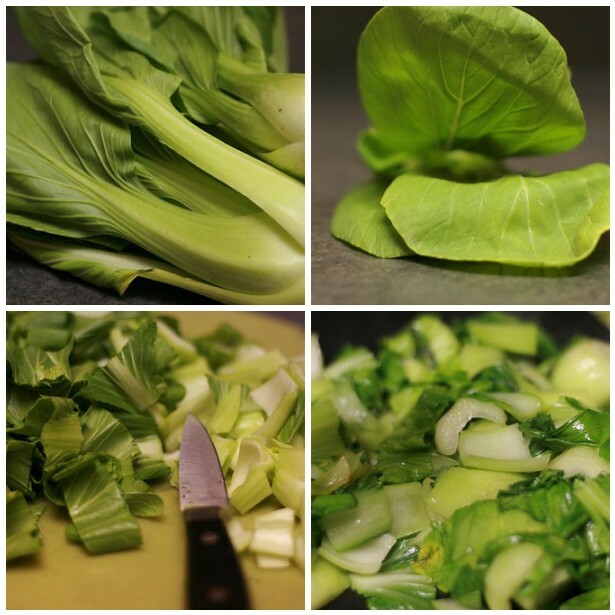 How to prepare: To cook Shanghai bok choy whole, strip the outer layers to reveal the tender heart. Stir fry or steam them whole (or halved) and serve them as an accompaniment to a braised dish such as pork braised in soy sauce (lo bak), Teochew braised duck, or thit kho. Here’s how I like to cook Shanghai bok choy. It’s not a recipe per se but more of a technique which you can use to stir fry any vegetable of your choice, from pea shoots to choy sum to Chinese cabbage. Cut about 1/4-inch off the bottom of each plant. Rinse thoroughly to get rid of the dirt in between the stems. Cut them crosswise into 1-inch pieces, keeping the stems and leaves separate. Preheat a 14-inch wok or 12-inch skillet over medium heat. Swirl in the oil and wait until it starts to shimmer. Add the garlic and stir for 15 to 30 seconds until fragrant. Raise the heat to medium-high, throw in the stems and toss to coat with oil and garlic for about 1 minute. Add the leaves and keep tossing until the leaves are just wilted. Add the salt and stir until some liquid has been released and the vegetables are tender and bright green, another 1 to 2 minutes. If you’d like a little more “sauce,” add a tablespoon, or two, of water. Drizzle with sesame oil, if desired, and serve immediately. If you’d like more information on bok choy or other Asian vegetables on the go, please consider purchasing the Asian Ingredients 101 iPhone app. this and understand this side of the story. It’s surprising you’re not more popular since you certainly have the gift. capital to assert that I acquire actually loved account your weblog posts. Thanks, Leah! Isaac is 19 months now and just started daycare 3 days a week so I can write again. It’s great to be back. Hope you are well!